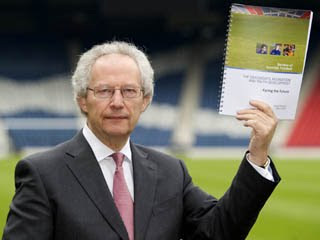 As Labour's Leisure, Arts and Communities spokesperson on Dundee City Council I welcome the publication of the Review of Scottish Football carried out by Henry McLeish. I will be contacting officers of the council and the SFA to ensure that Dundee is included in future plans to develop our national game. I welcome the publication of this report and I will be studying its recommendations in some depth. I want to ensure that Dundee is at the forefront of plans to develop facilities and improve football. I know that a lot of excellent work already goes on in Dundee, often through the hard work of volunteers, but we need to ensure that they get as much support as possible. I am particularly interested in proposals to ensure that the school estate is fully utilised to support the development of football and other sports. These are difficult economic times but we should not neglect sport and physical activity. In the long term I believe that investment in sporting facilities can lead to numerous benefits not only related to sport but also to health and even educational attainment. You can read the SFA press release here. This evening I attended the latest meeting of the West End group which is looking for ways to deal with the problem of graffiti. At the end of May we hope to deal with some of the areas of the West End which are blighted by graffiti. I am clear that there should be zero tolerance of graffiti. Graffiti has a huge impact on people's lives and runs down their neighbourhood. I am looking forward to the community in the West End joining together to make a stand against graffiti. This evening I attended a meeting of the board of Dundee Ice Arena. This was a very interesting meeting which looked at interesting future developments. I look forward to further developments. Tonight I attended the Annual General Meeting of the Blackness Area Residents' Association. This is an excellent organisation which looks after the interests of residents in the Corso St, Abbotsford Street and Place area. There was a presentation about how the council deals with anti-social behaviour. The message is clear that people should not suffer from noisy or inconsiderate neighbours they should seek help from the anti-social behaviour team phone 0800 169 3845 or from the police phone 0300 111 2222. This afternoon I was out campaigning with Jim McGovern, Marlyn Glen MSP, Johann Lamont MSP and a group of Labour activists in the Fleming Gardens area. The response on the doorstep was very good. This afternoon I attended a briefing for elected members on the next phase of work at Dundee Waterfront. There will be works starting in early May to realign the Road Bridge off ramps and to pave the way for the major works which will hopefully lead to the V & A coming to Dundee. You can read about these projects on the Dundee Waterfront website and in due course there will be information about the works. To conclude a busy day I attended the regular meeting of the Harris Academy Parent Council. This was a very interesting meeting which looked at the planning for the new school. I hope that progress will be made soon on making this a reality. I look forward to the Scottish Futures Trust beginning to deliver a new school for Harris Academy. This evening I attended a meeting of the Parent Council at Blackness Primary. This meeting focused on the problems of parking and dropping off at the school. There are real concerns about this problem and I will be contacting council officers to see if there is more that can be done to ensure that everything that can be done to improve road safety is done to improve safety. I am always happy to listen to the concerns of local parents and do my best for the schools in the West End. Today I also met with Iain Gray MSP, he was in Dundee to address the STUC Congress in the Caird Hall. After his speech along with Jim McGovern and a large team of Labour activists Iain went campaigning in Dundee West. There was an excellent response in Downfield. After the campaigning Iain and Jim went to visit the Claverhouse Group to discuss training and what can be done to create more jobs. This morning I attended a meeting of the Dundee Fairtrade Forum. The meeting looked at what more we can do to promote fairtrade in the city. I am clear that the City Council can do a lot more. I am keen to work with other councillors to ensure that the City Council does do more. Tonight saw the latest Labour Party video about the election broadcast on TV. Click above to watch the video. This evening saw the monthly meeting of the Development Quality Committee. There were three planning applications decided upon. We also agreed a submission to the Scottish Government about domestic micro-generation. Today many International Development charities are marking World Poverty Day. I am particularly interested in international development issues. I think that Labour in government has done a great deal on these issues. You can read about Labour's manifesto commitments on International Development here. You can also watch a short video about how important this is by clicking above.